A group of us had a craving for mountain-loads of salty delicious meat and decided to indulge ourselves in a visit to a restaurant that serves just that. Meat, as the name suggests, is a smokehouse with a wide selection of BBQ, house made sauces, and a great selection of local beers on tap. 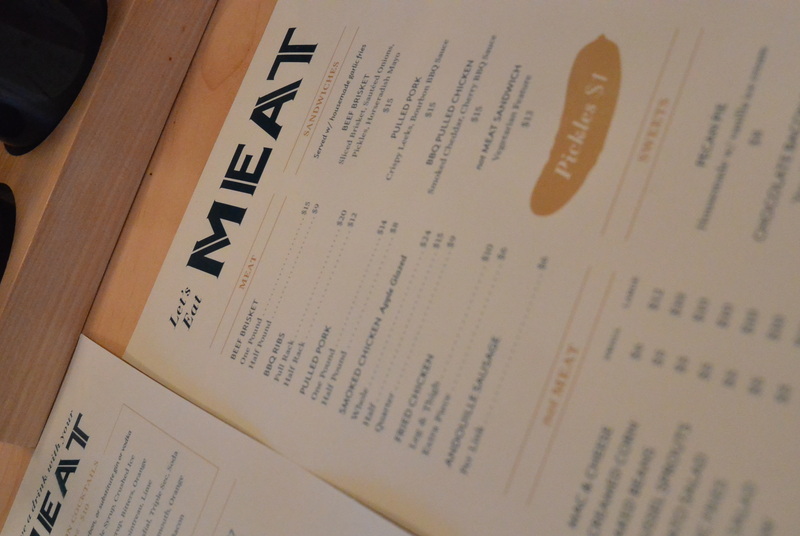 Meat takes no reservations so seating is prioritized on a first come first serve basis. We arrived with a party of 6 at 5:30 pm on a Saturday evening, and the restaurant was already full. 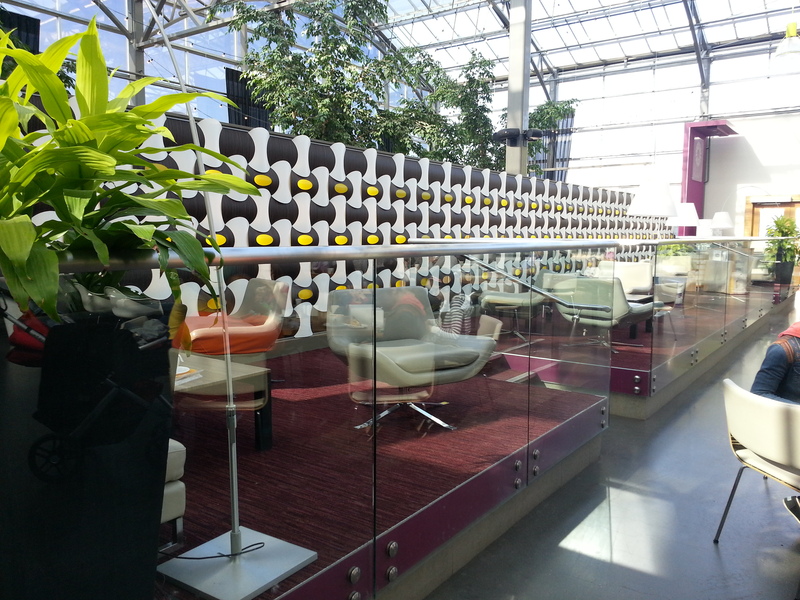 We had to wait an additional 40 minutes to be seated, which was expected given its popularity at the moment. While we conversed over beers in the waiting area, I admired the contemporary, clean, open layout of the restaurant and a nice use of a blue/white colour scheme. As we were finally seated at our table, which was designed to look like a large outdoor bench, we browsed through the simple, well organized menu. 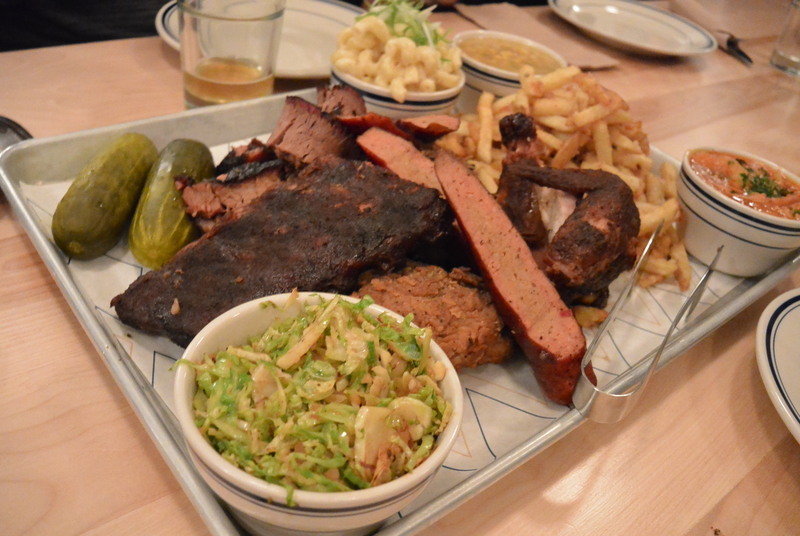 The types of meat were clearly laid out as were their sides and beer selection. We wanted to try a bit of everything, so we decided to try the Meat Platter and added a half pound of extra brisket, extra order of sausage, and a few extra sides. Beef Brisket – Tender, slightly dry, nice crispy charred crust, and medium smoke flavour. Overall, quite enjoyable and paired extremely well with the cherry and bourbon BBQ sauces. Pork Ribs – Tender, slightly dry, blackened outside, and medium smoke flavour. The smoke enhanced the flavour of the ribs and paired well with the spicy and bourbon sauces. Pulled Pork – Soft, moist, and medium smoke flavour. Paired well with the bourbon sauce. 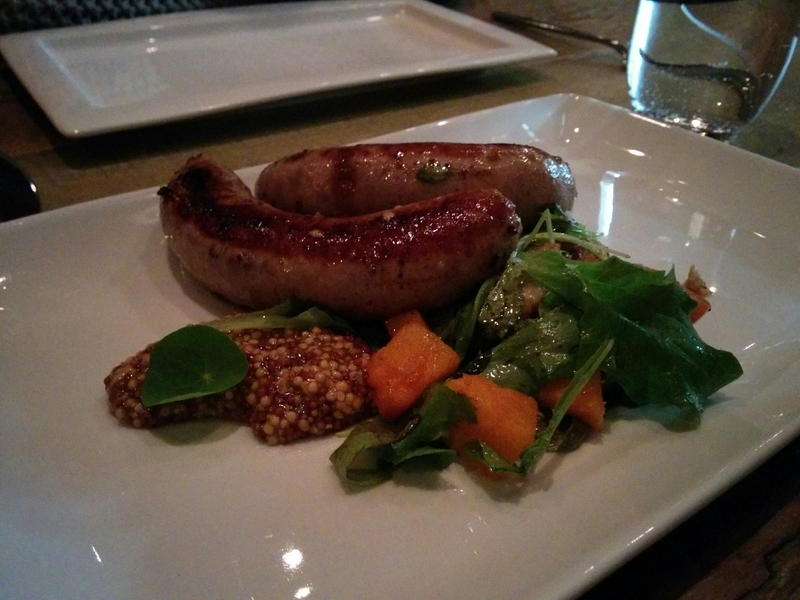 Andouille Sausage – Flavourful combination of spices and light smokiness. They were excellent and we were glad we ordered an extra serving. Best enjoyed without any sauce. Smoked Chicken – Tender and moist inside with rich smoked outer crust. It can be had without sauce or with the spicy BBQ sauce. Fried Chicken – Very crispy outside with a moist inside and not greasy. Definitely memorable fried chicken. Best enjoyed with no added sauce. Mac & Cheese – Creamy but not cheesy enough for my taste. There was nothing special about this dish. Garlic fries – Crispy fries with rich garlic flavour. These fries were phenomenal. Brussels Sprouts – Shredded and served like a warm salad. This was definitely an interesting new way to enjoy brussels sprouts and it was definitely good. Creamed Corn – Infused with subtle dill flavour. It was a little on the watery side, but still a very enjoyable side dish. Overall, the meat was good, but not outstanding. It was not too dry, not too salty, and not too overly smoked. The BBQ sauces that accompanied the meat were great though. 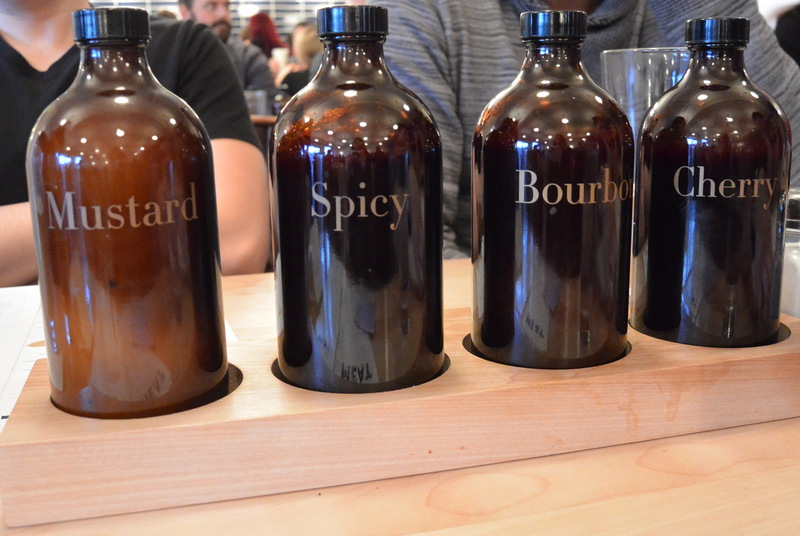 We enjoyed the Cherry and the Bourbon sauces the most. The sides, however, were hit or miss. The Brussels Sprouts and fries were a definite hit. I wouldn’t recommend the chicken stew or the mac & cheese though. Overall, if you are looking for a place to eat BBQ meat and to relax over a few local beers with a group of friends, Meat is the place where you want to be. 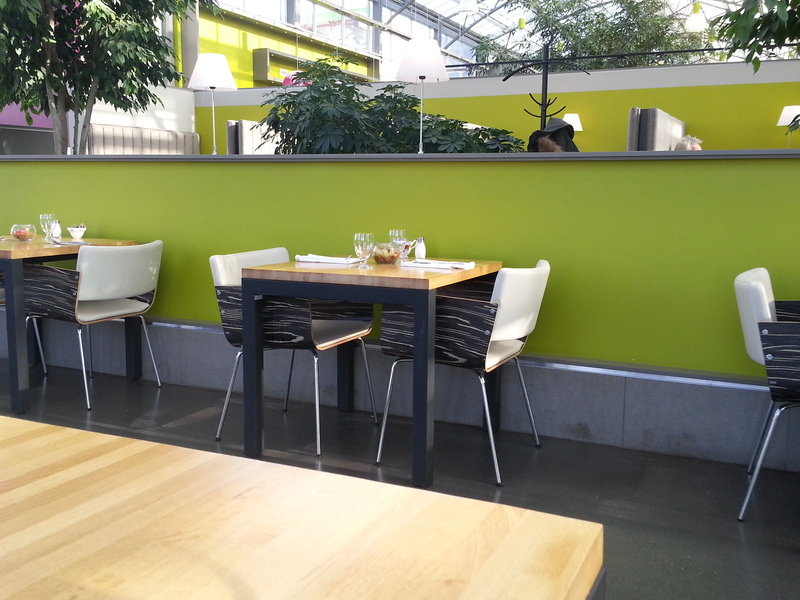 Cibo is quietly located in Oliver Village just north of downtown Edmonton near the Macewan University City Centre Campus. It offers excellent Italian food made from fresh local and in house ingredients. The result is an excellent food experience that satisfies the palate. Inside, is a cozy, candle lit environment, which can be intimate, yet casual enough for gathering with friends. Tables are wood finish with a central modern looking bar and an open concept kitchen. There is also a large table tucked away in a semi-detached room giving you more privacy for a larger party. The servers were friendly and knowledgeable. We started off with the veal and pork meatballs. The appetizer presented simply yet elegantly. 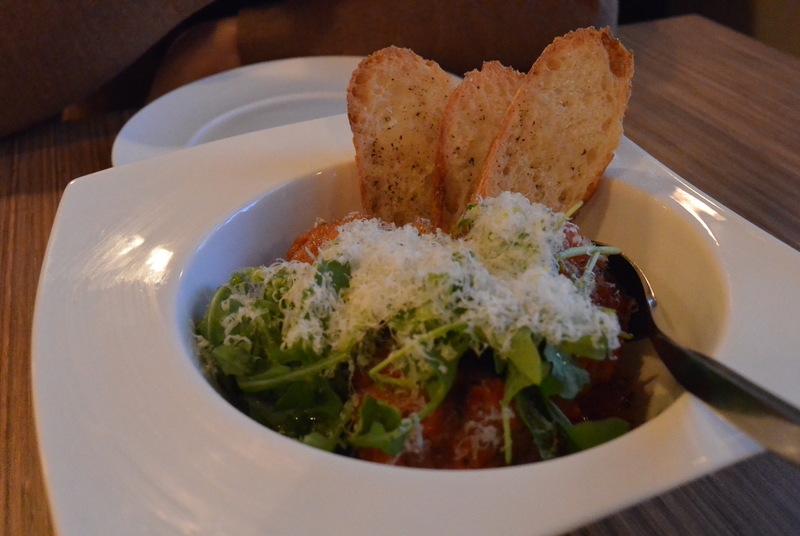 There were three very large meatballs topped with microgreens and pecorino romano. To start, the sauce was a robust and spicy tomato, which packed a punch but was not overwhelming. The meatballs themselves were quite delicious. They were soft, moist, and flavourful. The incorporation of the dried apricot gave it a nice fruity sweetness that complemented the veal and pork flavours very well. Together with the tomato sauce, these meatballs were excellent. The serving size was quite generous as well. Overall, it was a very good start. With our mains, we ordered a side of Brussels sprouts. 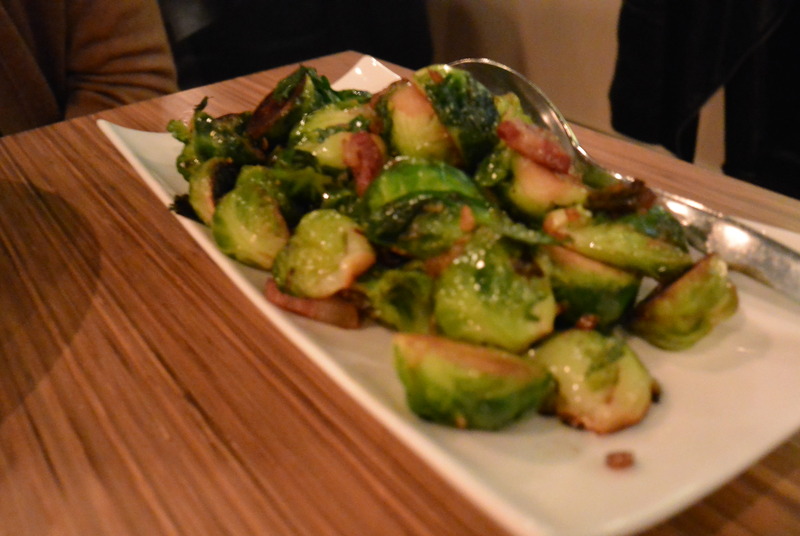 The sprouts were sauteed with pancetta to add a buttery and peppery flavour. Although the Brussels sprouts were a little undercooked, they were quite enjoyable and was generously portioned. 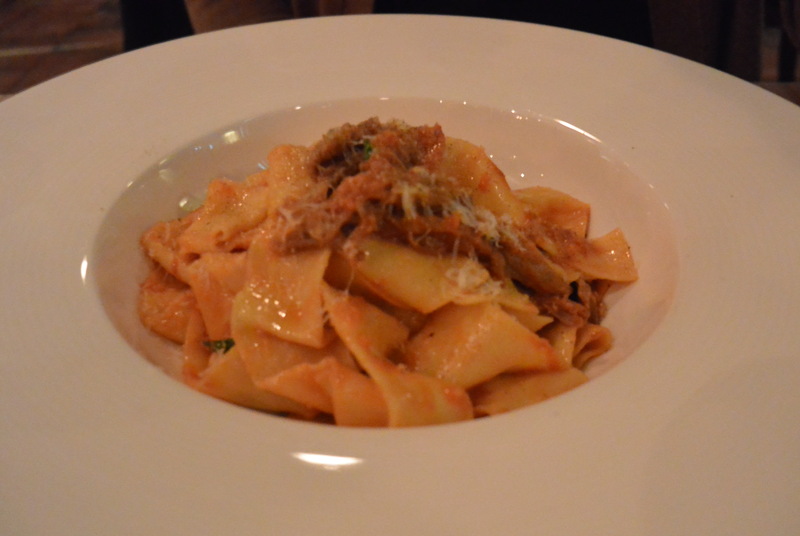 For our mains, we ordered the pappardelle and the gnocchi. The hand made pasta was cooked al dente and gave a perfect bouncy texture with each bite. This is how pasta should be done. It was coated lightly with a garlic tomato sauce. On the first initial bite, you taste the soft tender lamb and the warm tomato sauce. Immediately after that you notice a refreshing flavour of mint which fills your palate and nostrils, but not in an overwhelming sense. It adds freshness to an otherwise warm dish, which gives this dish such uniqueness. I have to say, it was an excellent pasta dish and I would highly recommend this dish to anyone. My better half ordered the Gnocchi, which was excellent as well. The gnocchi was soft and tender and “melted” in your mouth. The filling was quite light and fluffy. The cream sauce is not at all heavy. The initial flavours are light and subtle hints of the romano cheeses and the gnocchi filling followed by the rich and earthy truffle. 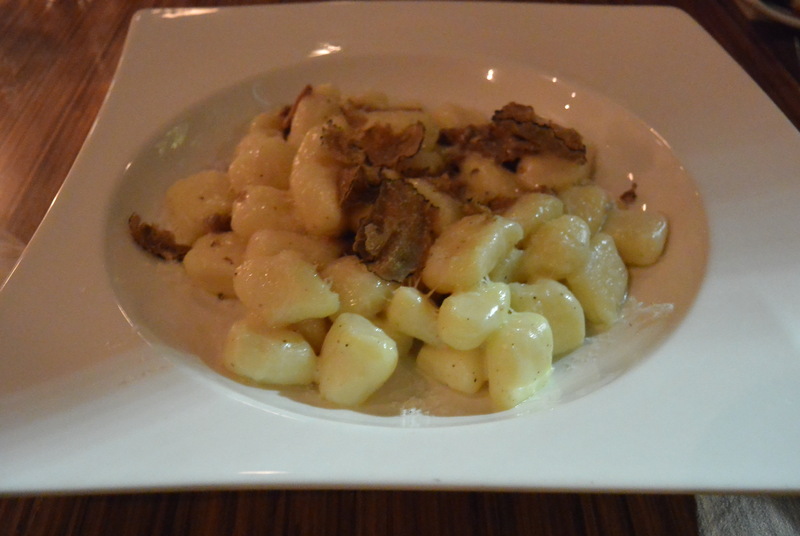 The soft gnocchi and the flavours of the romano and truffle make this a very comforting dish. If you are a fan of gnocchi, this dish is a must try. 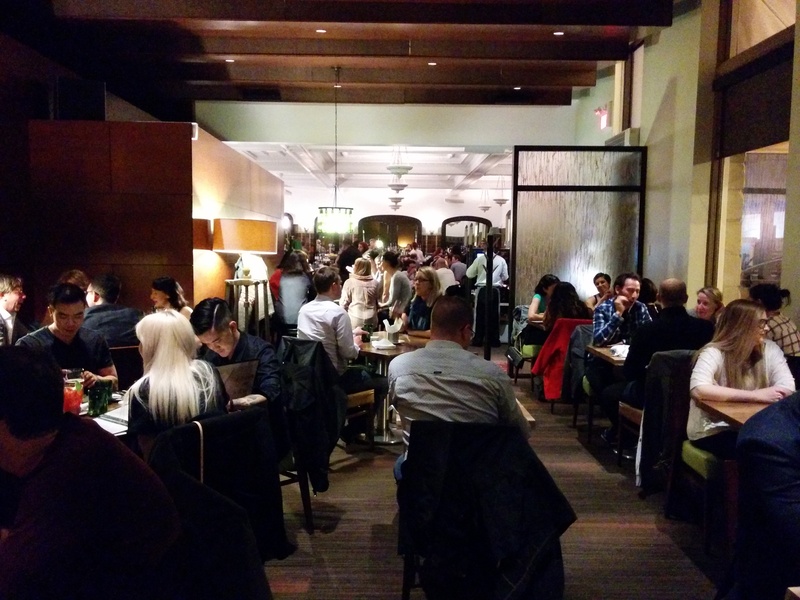 Cibo is an excellent asset to Edmonton’s growing restaurant scene. Their ever changing menu provides fresh local and house made ingredients that cater perfectly to the season. Their dishes are simple, yet unique and creative, and focus on providing complementary flavours. I would highly recommend this restaurant to anyone looking for a new contemporary Italian restaurant and excellent pasta. 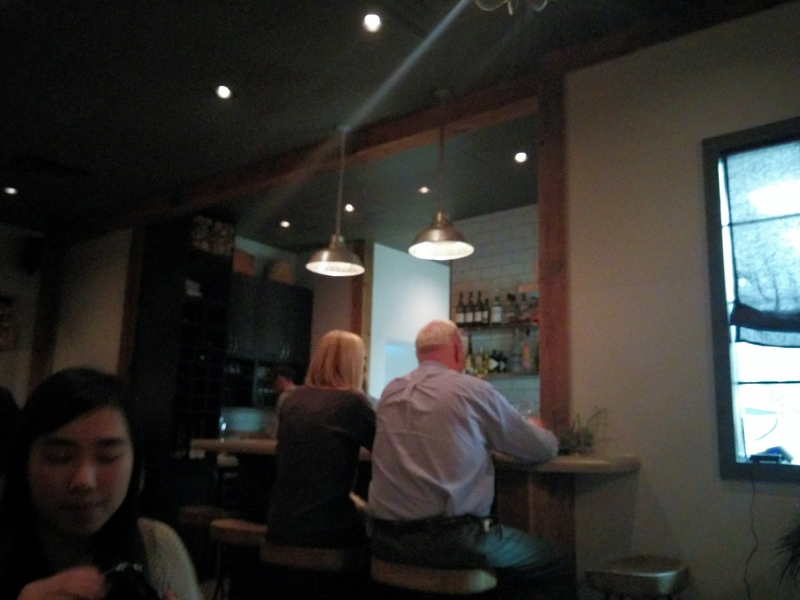 Tzin and wine is a fabulous little restaurant in the heart of down town and makes for a great night out either with friends or with a date. The restaurant holds about 20 guests and has a very artistic vibe to it. The restaurant’s main website will illustrate that quite well. 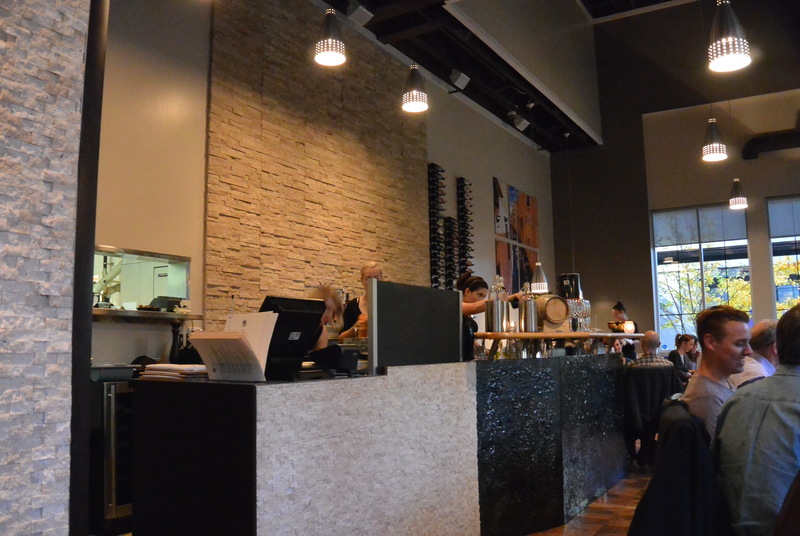 The staff are very friendly, knowledgeable, and have excellent recommendations for wines and food. Karen and I ordered the mushroom tart and the seafood paella for two. 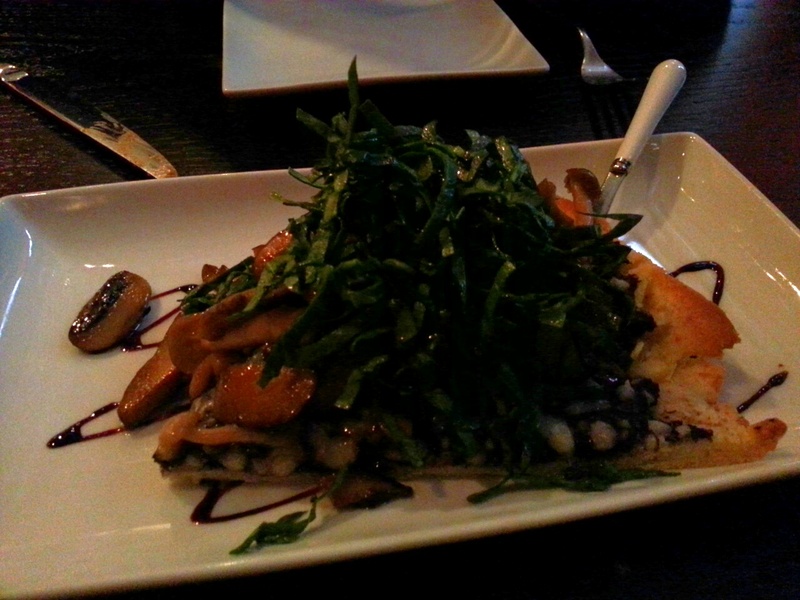 The mushroom tart was phenomenal. Sauteed mushrooms and truffle were made to be paired together, but add a warm crumbly tart, melted Gruyere cheese, and a bed of crunchy spinach and you have heaven on a plate. You have to try this. The seafood paella was loaded. Lots of huge tiger shrimps, scallops, and perfectly done mussels. However the rice itself was not that impressive. There was too much sauce making the rice overly soaked and wet. The rice in a good paella should not be this saucy and this mushy. We were a definitely a little disappointed with the paella. Unfortunately we did not order any other tapas, but seeing what other guests ordered looked delicious. This is a great little Wine and Tapas restaurant with great service, friendly staff, and very decent food. I will certainly be back again to give the other tapas a try and to pick out a few interesting wines that Tzin offers. Tavern 1903 at the Alberta Hotel is the new addition to the famous Hardware Grill. They focus on a modern twist on traditional food. It has two feels to it. 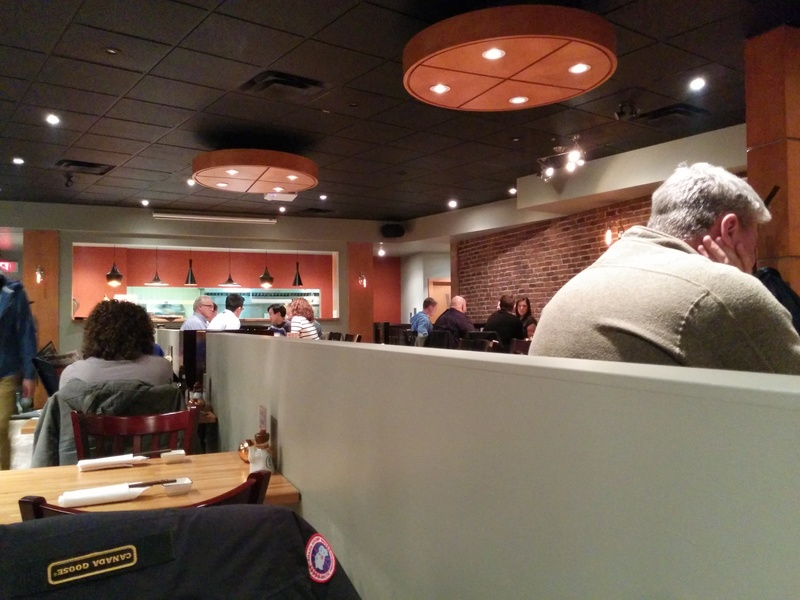 The bar side is bright and lively, while the dining room side is a mellow and comfy. Both sides are decorated differently and both sides catering to different crowds. This gives the restaurant a sort of black and white variation, which gives the restaurant uniqueness and character. My companions and I sat on the dining side, but we realized soon, that we would have rather sat on the bar side. I think the causal ambiance on the bar side matches both the personalities of the staff and the food. We started with 3 appetizers to share: the pork belly, the cauliflower, and the crab cakes. Starting with the pork belly, it was done well, albeit slightly overcooked to the point where the meat portion was a little chewy. That being said, the pork belly was actually very good. It was rich and the combination of the of the smoked ribs gave it an extra kick. Of course the fatty part of the pork belly melted in your mouth and when it does, you get the full flavour of the pork that is so satisfying. I felt that the pretzel bun was out of place. It didn’t add anything to the dish that was not already in the pork belly. It was odd since it was difficult to cut into pieces to eat with the pork belly and even if you were successful, it didnt pair well with it. I think a soft steamed sweet bun would accompany this dish much better than the pretzel did. Moving on to the highly recommended Korean Fried Cauliflower. The cauliflower was fried in a crunchy batter and covered with a sweet, sour, and spicy sauce. The sauce was great. It was a perfect balance of all those three flavours. Also, although had been soaked in sauce, it still remained crispy and very enjoyable. My only issue with this dish is that we were unable to taste the cauliflower despite a non-overpowering sauce. The final appetizer that we shared was the crab cakes. I’m going to have to say I was disappointed in these crab cakes. They were devoid of flavour and worst of all, they lacked crab meat. After some good conversation over a bottle of red from their excellent wine list, our mains arrived. One of my companions and I ordered the short ribs and my other companions went with the crusted salmon and the chicken and waffles. The fries were great. They were fried to perfection and flavoured with truffle oil to give it boldness. That was as far as I go in complimenting this dish. The short ribs were very disappointing. With my first few bites, I noticed that it lacked the flavour and moisture that I would expect from slow cooked short ribs, especially after trying the short ribs at Wildflower Grill. Here I was, constantly reaching for my glass of water to wash down the dry, bland beef. This dish would certainly benefit from more sauce and some seasoning for the beef. Even the accompanying vegetable medley which were seasoned with salt and pepper had more flavour than the beef. Unfortunately, I did not try the salmon nor the chicken and waffles. However the consensus was that the chicken and waffles lacked flavour as well. The salmon was more enjoyable. It was crusted well and paired well with the sauce, but my companion was not overly impressed by this particular dish. 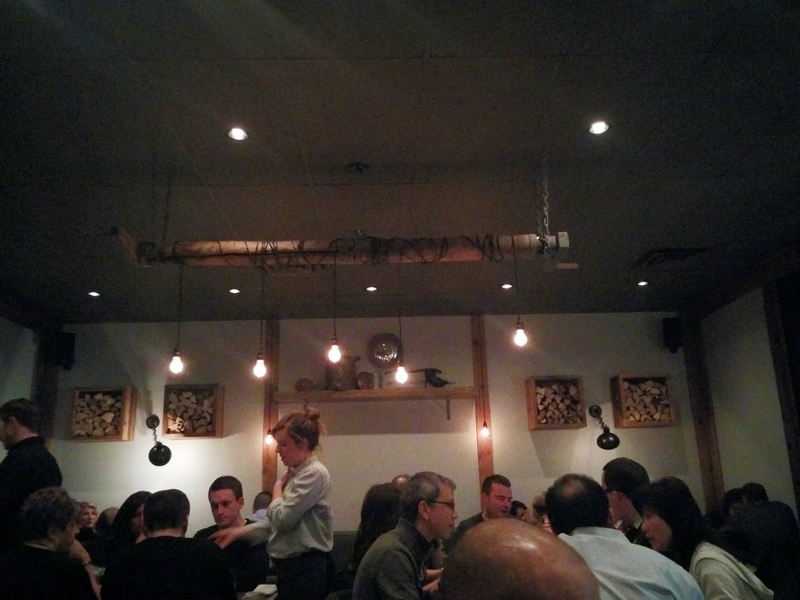 For the #2 rated restaurant of 2014 in Edmonton, I was not impressed. The atmosphere and the wine selection was great, but the food that we ordered was neither innovative nor satisfying. Their dishes lacked flavour and attention to detail. On top of all that, the prices were on the expensive side. With appetizers around ~$10-15 each, ~$30 main dishes, and $1 each for still water, we were looking at close to $50/head before the wine. This restaurant requires some major fine tuning before I can give out any recommendations. Joined by tfung’s roommate, an avid foodie as well, and his girlfriend, we ventured out to the talk of the town: RGE RD. There was actually much debate about how this restaurant was pronounced, and in the end, we were told that it’s “Range Road”. Something I’ve seen pop up quite a bit out West are these amazing “Farm-to-Table” Restaurants. I’ve studied this form of business model in dietetics and how economically healthy it can be. 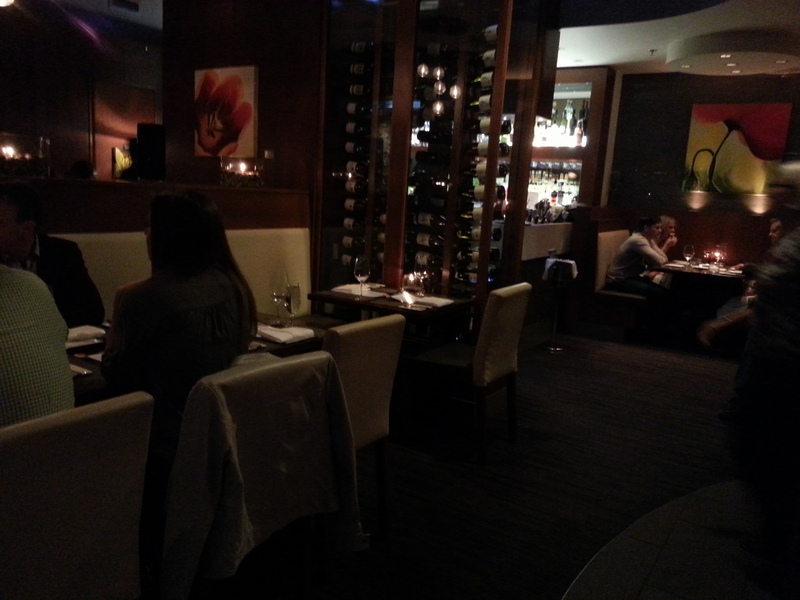 We were promptly seated, right near the entrance, where we were given a good view of the whole restaurant. There was also a small window through which we were able to peer into the kitchen, which was a nice treat. The restaurant was decorated like a farm with wooden tables, chairs, and wall fixtures, which was perfect for its advocation in farm-to-table foods. In fact, there was a faux fur pelt where tfung was sitting (we made a joke that the pelt made him very fabulous). Our waiter was very inexperienced. He stuttered and struggled with naming all the dishes they were offering (as some of them do change from day to day), and had to refer to his small piece of paper for notes. However, given the young age of the restaurant, I thought that was tolerable. He was very kind and checked up on us frequently, but not enough to be annoying. We started off with three appetizers. It wasn’t too hard for the 4 of us to decide on which ones we wanted. The first appetizer was the apple-fennel sausage. The sausage was very succulent and fresh like it was prepared just as we ordered. There was a slight hint of fennel, but unfortunately we were not able to appreciate the apple. As you bit into it, the juices and the meat exploded from the restraints of the casing. Along with the sausage was a very nice mix of squash and greens, paired with a mustard seed sauce. The sausage was certainly made to order and tfung really appreciated how fresh it was. The difference between a sausage that had been prepared days ago and a sausage that was prepared hours ago is significant. Our second appetizer is the hunter’s stew. In the dead winter of Edmonton, after experiencing one of the coldest weekends I’ve ever had, I thought this dish was very satisfying. 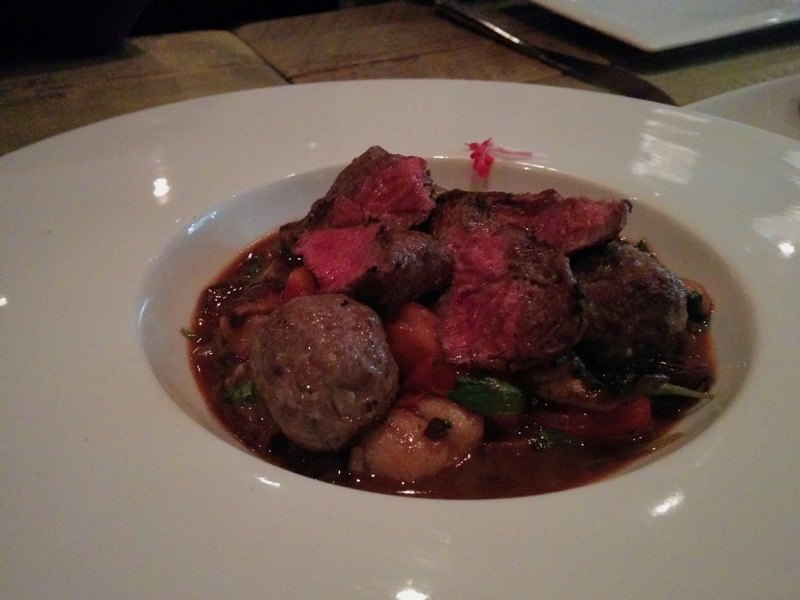 It came with bison, meat balls, mushrooms and gnocchi. Everything was very hearty with rich flavours in a bold, meaty gravy. The bison was so tender and absolutely delicious with the gravy. The meatballs were certainly different. It was compressed meat with no fillers leaving them firm and rough, but were still enjoyable. 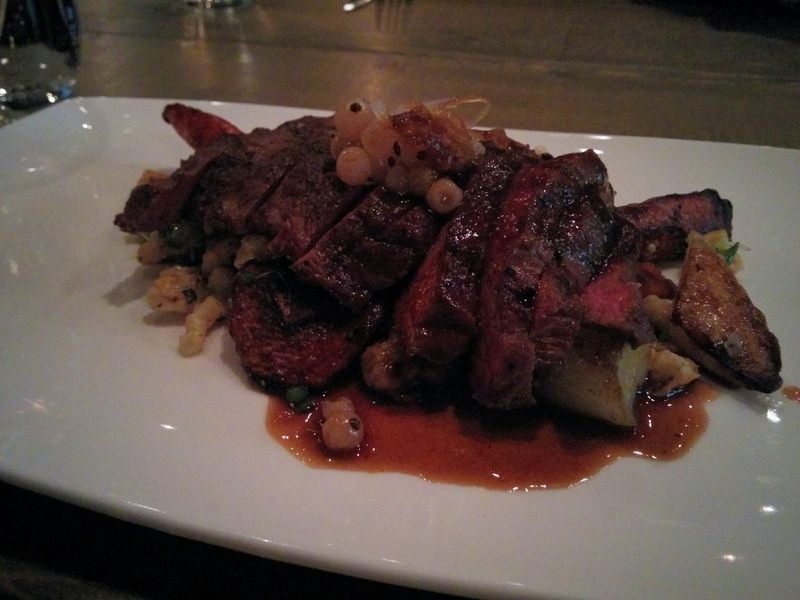 The sauce wasn’t too salty or overwhelming and complimented the wild game very nicely. Overall, a very enjoyable hearty stew from RGE RD. 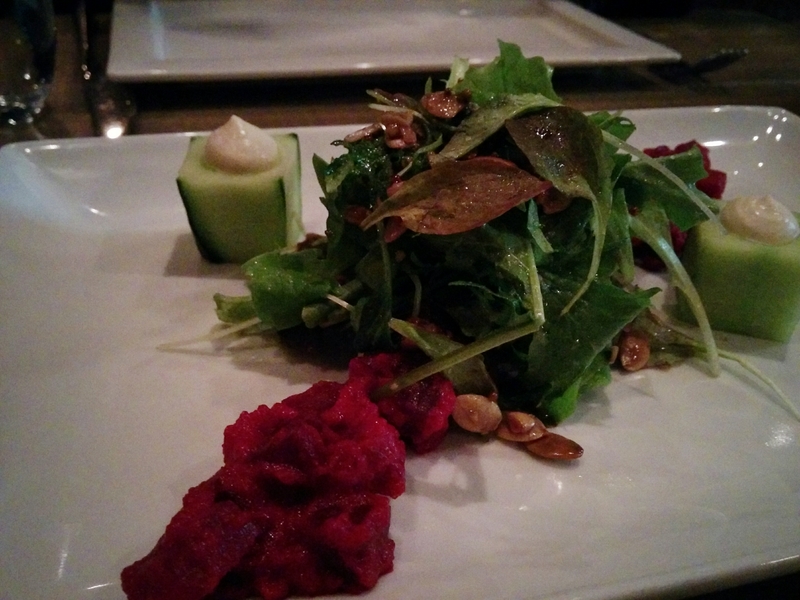 As for our final appetizer, we had the beet salad. Honestly, I wasn’t so impressed with the beets. I generally enjoy large whole slices of beets, where I can get the texture and flavour of the beets as I bite into them. Here however, they served two dollops of beets that were diced and therefore losing the firm texture that I enjoy so much. That being said, the salad was quite good, and the vinaigrette was excellent – not too sweet and not too sour. What I was most impressed with was the crème fraîche in the cucumber, which was excellently displayed. It was extremely fresh, smooth and added that dairy that balanced the sourness of the salad. For me, I ordered the bison as my main. Having had the hunter’s stew, it already foreshadowed that the bison would be delicious. And it definitely was. 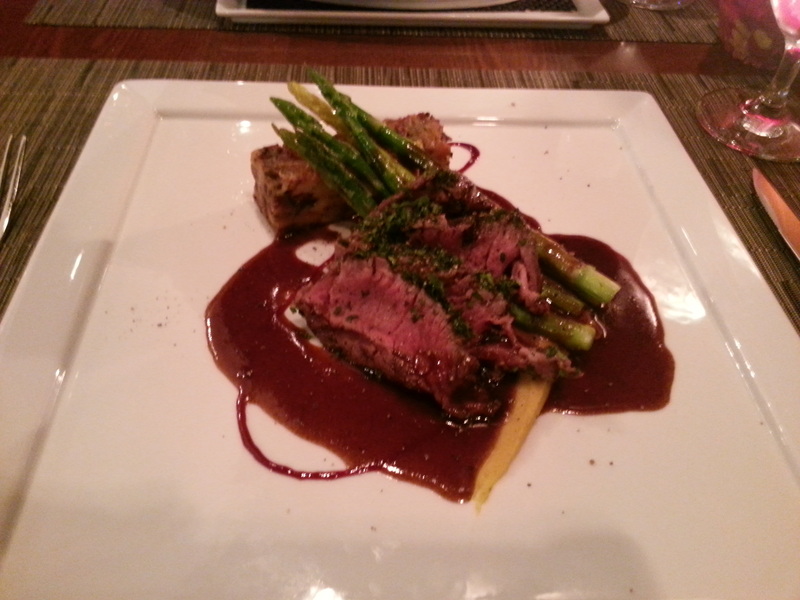 I had it cooked medium rare, and the balance between tenderness and chewiness was absolutely amazing. With each bite of tender and rich, perfectly aged bison, I was excited for the next! Underneath the bison was a bed of spätzle, which is a type of egg noodle/dumpling in a small uneven ball shape, that originates from central Europe. It was an extremely interesting texture, that added the starch that was needed for the dish. The charred carrots were very sweet and done so that they were just perfect. Tfung had the duck breast, which in my opinion was not as enjoyable as the bison, but still good. It had bold duck flavour and a hint of smokiness. However, the duck was lean and therefore a bit too tough to chew. 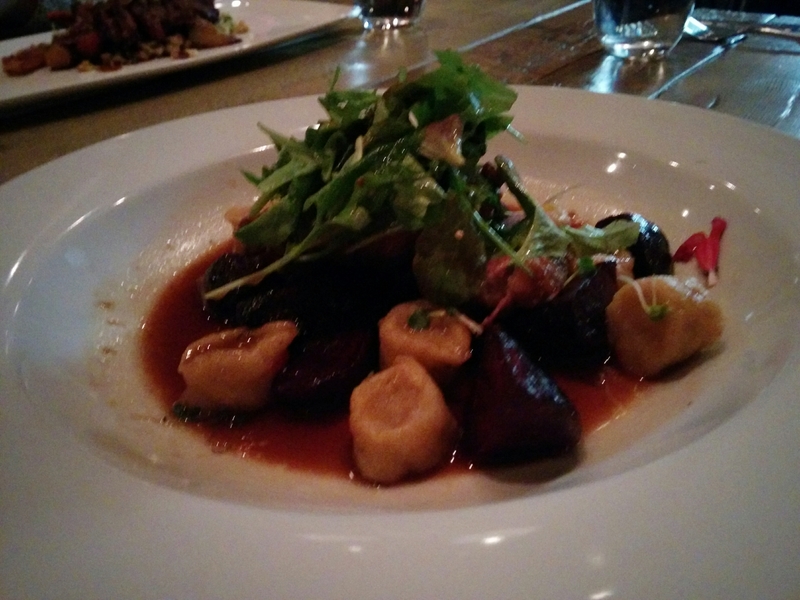 The beets were much more to my liking in this dish as they were in whole pieces and were roasted to perfection! Interestingly, the onion dumplings were almost like a gnocchi, but a little less starchy and had more of an onion consistency. It was very bizarre and we didn’t know what to make of it. It was an odd pairing in a dish like this, but certainly nothing to complain about. Overall, we thought that the food was fantastic. I also love the fact that they take produce and meat from local farms, promoting good farming practices. The service can be improved, and I’m sure that with time, the staff will be more comfortable with the menu. 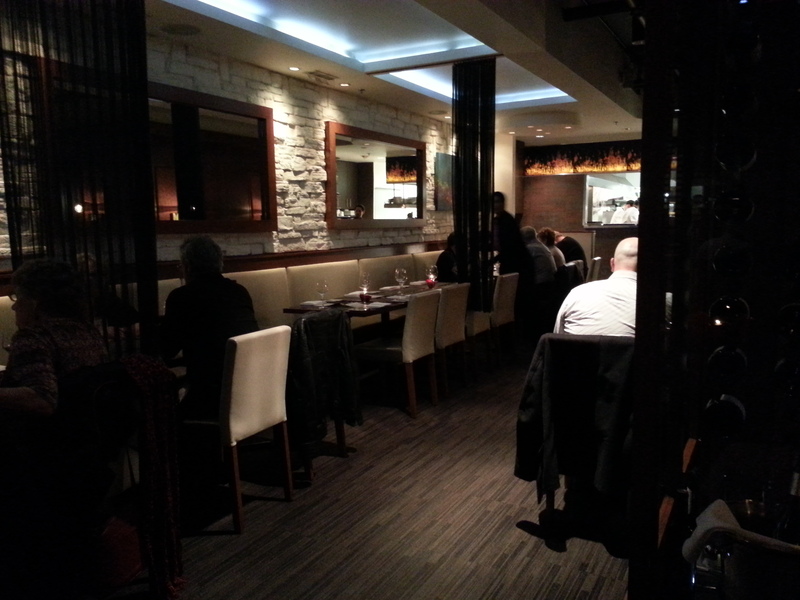 I can certainly see why this is rated as Avenue Edmonton’s #1 restaurant of 2014. 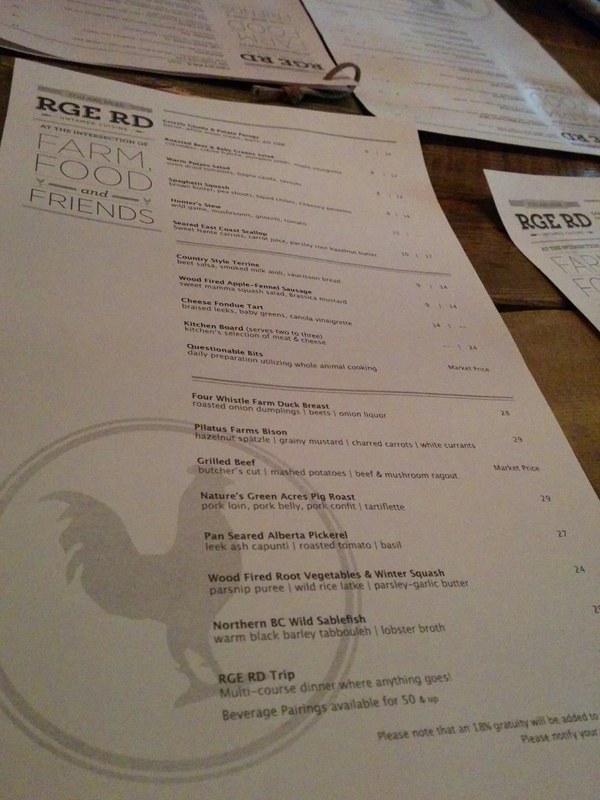 If you are a carnivore like myself, like a cozy relaxed environment, and love great food, give Edmonton’s newest addition, RGE RD, a try. 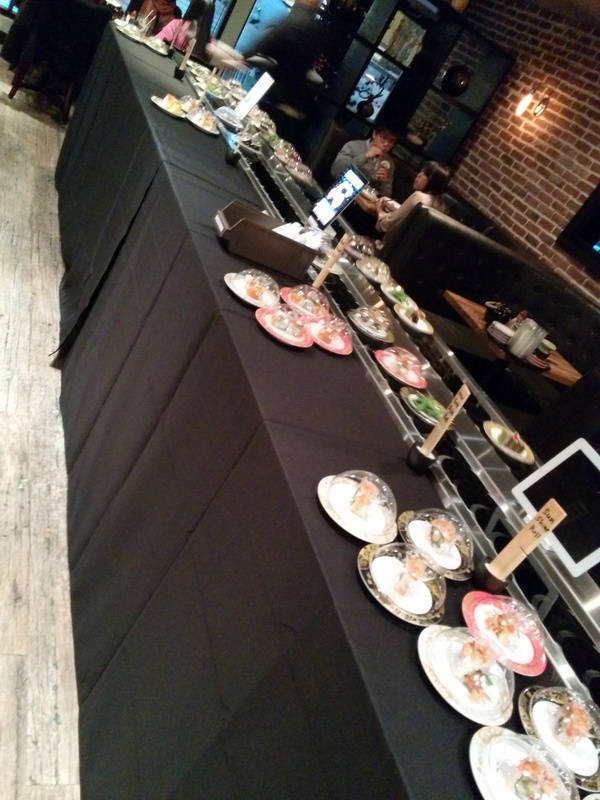 Kaiten Sushi (name of the catering service), which is operated by Japonais Bistro, was hosting an event to promote their mobile sushi bar catering. 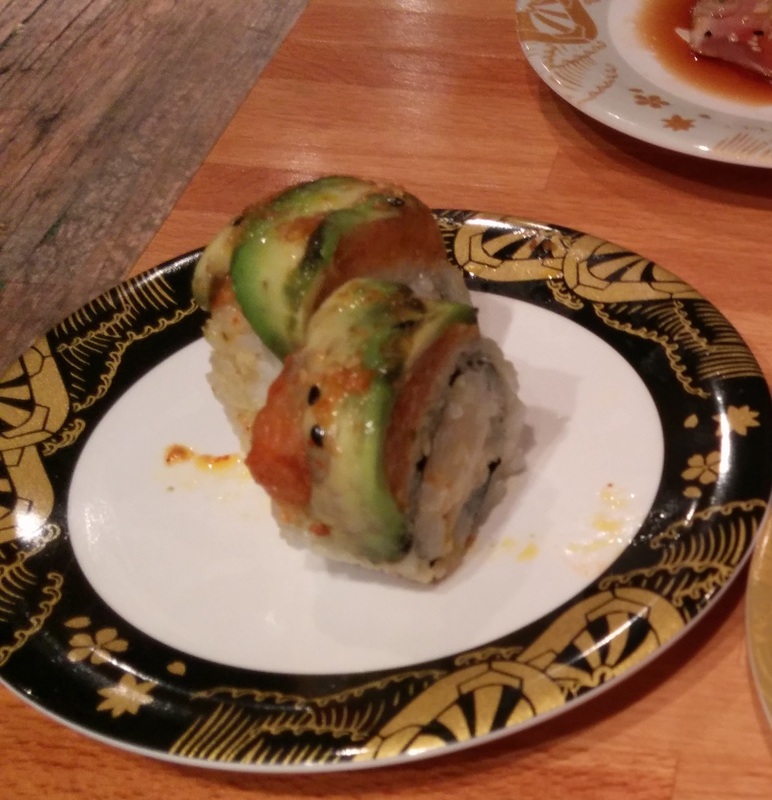 They offered all you can eat of a select items on their menu for $30 + 15% gratuity, which includes sushi, sashimi, maki, and a variety of cooked dishes that they have created. If you didn’t know, kaiten sushi in japanese means conveyor belt sushi. We decided to give it a try since the menu looked pretty interesting and it was a good price as well. The setup was very interesting. 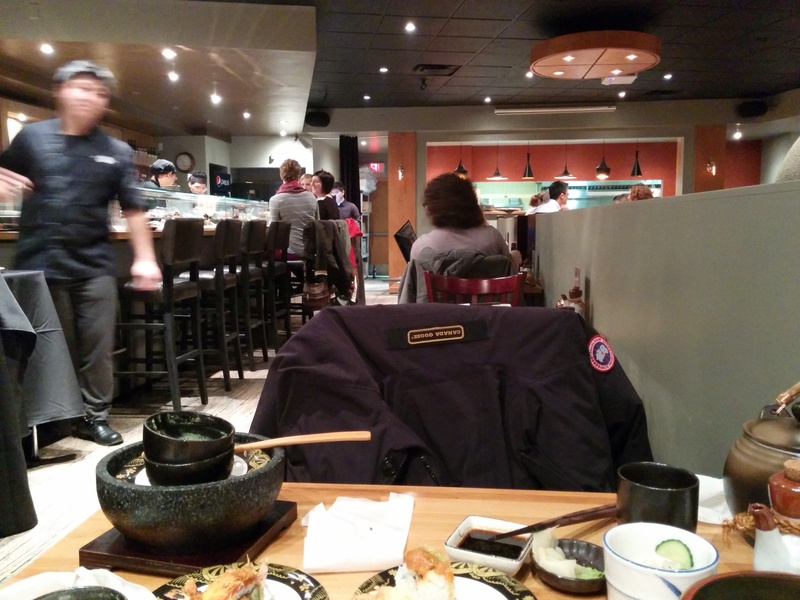 If you have ever experienced any type of kaiten sushi before, it is similar to that, except in this case you have to walk up to get your own food from the rotating conveyor belt as opposed to having the food rotate around you at your table. This was sort of expected since it is a mobile sushi catering service and it would be impossible to set up something like the ones in japan. The decor is modern and vibrant. The sushi bar is brightly lit so you can see the sushi chefs hard at work. All the rolls were 10/10 for creativity and uniqueness . I have never had any of these rolls before and each and everyone of them were worth trying. Some were obviously better than the rest. My favourite 3 rolls, in terms of taste and flavour, were the MT Fuji, Sunshine, and TNT. The MT Fuji shines because of the scallop, which gave the roll a very pleasant sweetness. The Sunshine was amazing because of the torched wild salmon on the top mixed in with the bonito flakes, which gave it a very smokey rich flavour. The sauce is on the TNT roll was outstanding and really made a very typical roll stand out and gave it that pop that landed it in the top 3. My least favourite roll was the MK roll. The combination of smoked salmon and fruity ingredients didn’t go well together for me. The beef tataki was good but not great. The quality of the beef itself was done well, however it was a bit too thick for a beef tataki. Also there was too much ponzu sauce to the point where the beef was swimming in it. It was also a bit too sour for my liking. The glass noodles were done well and the sauce wasn’t too overpowering. The new style sashimi was great. They used very fresh tuna and salmon and I liked how they torched them on one side. The yuzu soy had a very subtle hint of yuzu flavour in it which added to the freshness of the sashimi. Tuna nachos were good and interesting to say the least. The combination of the avocado, sashimi, and a deep fried chip went really well together. However, I couldn’t say the same for the sushi tortilla. It was dry, bland, and poorly put together. Now onto the main menu items. To start, we tried the pork cheek tempura. It was delicious. The outside had a lightly crispy batter and on the inside, there was a very tender and moist pork cheek that was relatively lean. 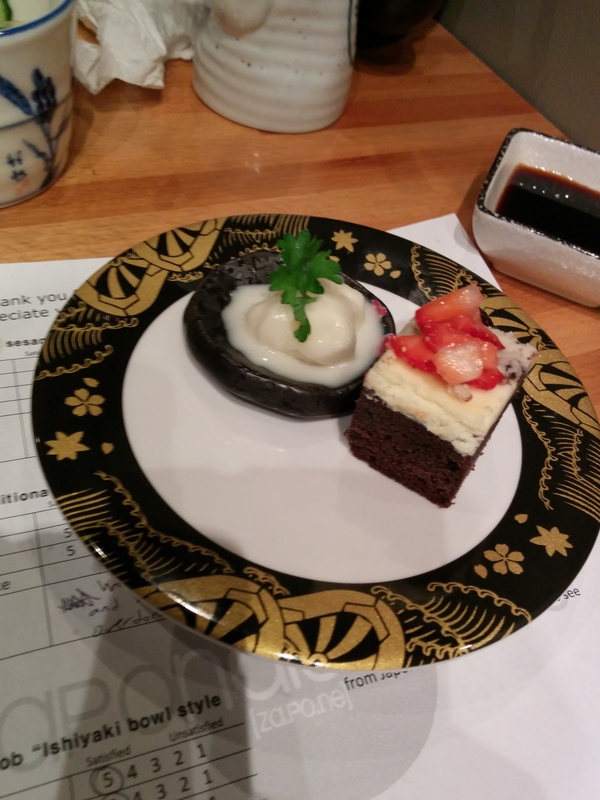 It was topped with a wasabi sour cream and yuzu salsa. 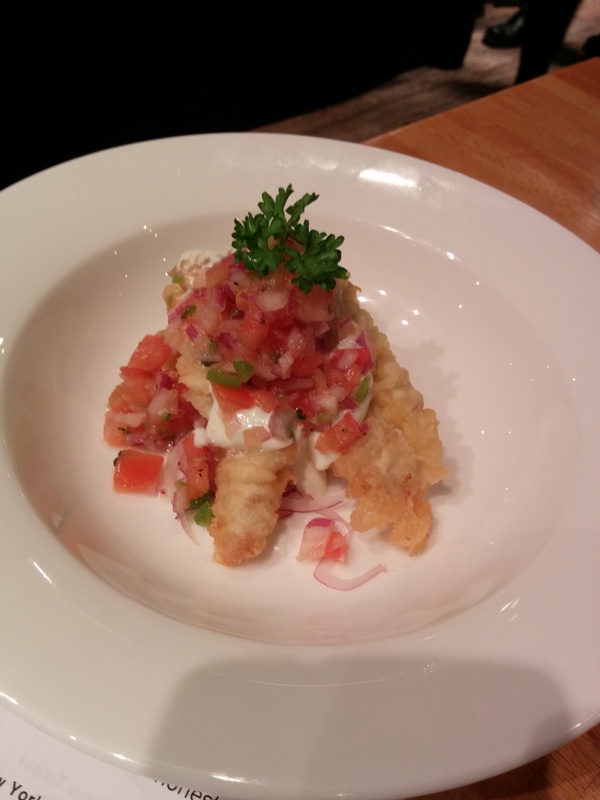 Although we couldnt really taste the wasabi or the yuzu flavour in the salsa, it was a very good dish and innovative. The seafood udon was not enjoyable. 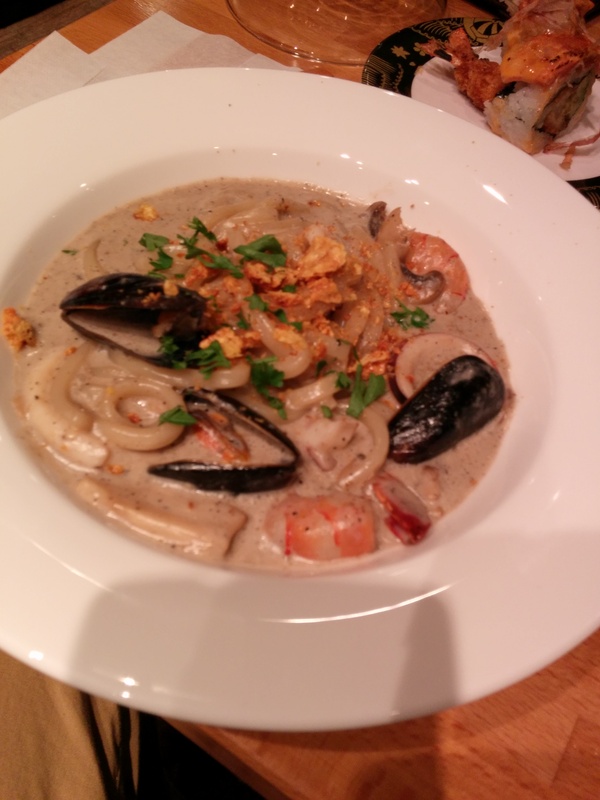 The seafood was not fresh (likely frozen) and the sauce resembled a condensed can of Campbell’s mushroom soup. It was not something you would expect at a Japanese restaurant. The Bob “Ishiyaki” bow was great. 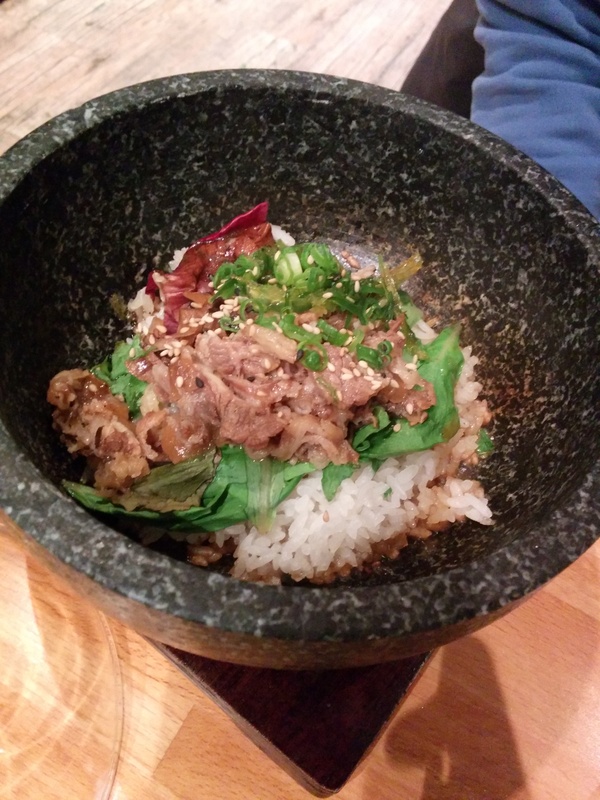 It came in a hot stone bowl which gave the rice at the bottom a very nice crispy layer. The sauce was excellent. It was soy based but the addition of the onions, seaweed, shitake mushrooms and butter gave it a very nice aroma that gave the dish an excellent flavour. I highyl recomend that dish. The ramen on the other had was very poor. The noodles taste like the frozen ramen you can buy at the grocery stores and the broth was bland and boring. For dessert we had the Matcha Crème Brûlée and the Double Cheesecake brownie with yuzu yogurt icecream. The Crème Brûlée was delicious. 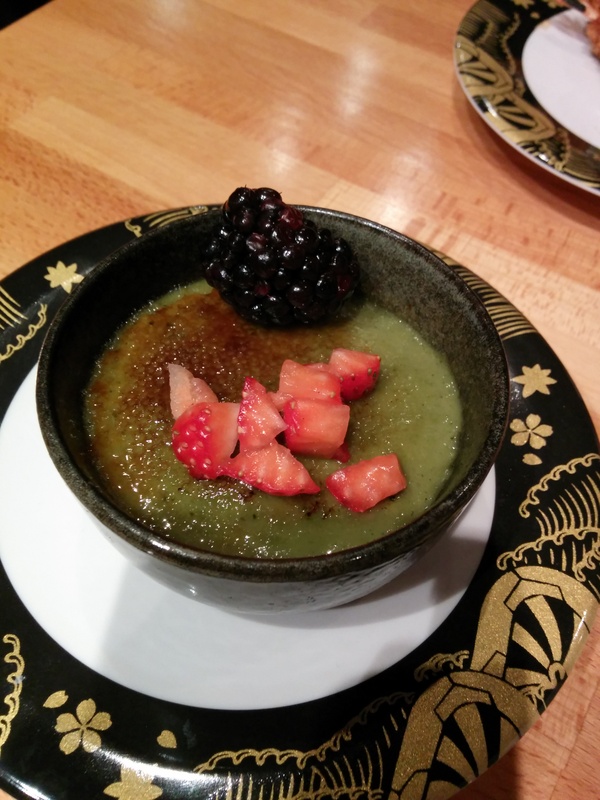 The green tea flavoured custard with the hard caramel top was a real treat and a must try. Yuzu yogurt icecream had a very strong yuzu flavour but was very good. Unfortunately it was almost melted by the time it arrived. The cheesecake brownie tasted neither like cheesecake or brownie and was frozen solid. I wouldn’t recommend it. Dining at Japonais Bistro and sampling the mobile sushi bar by Kaiten sushi was a very interesting and delicious experience. The food was certainly very innovated and intricate. There was a lot of attention to detail applied in creating the dishes as well the presentation of it. Most of the food tasted as good as it looked, however there were a few not so great ones. Although the servers were extremely busy at the event and were unable to attend to us consistently, the experience was very positive. There is another Kaiten sushi event next Wednesday, November 27th and I would highly recommend everyone to try it out. Well here is an interesting restaurant. 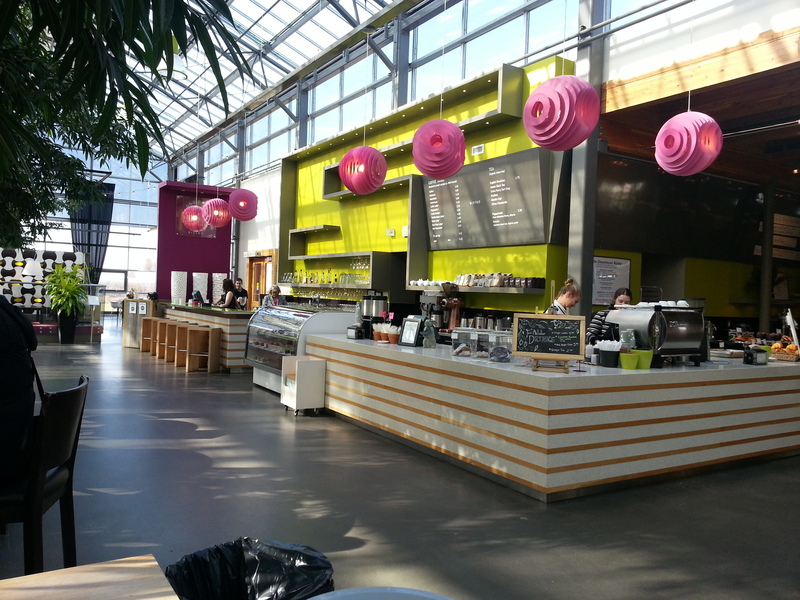 Located on a country road in St. Albert near Edmonton, is a restaurant that is part of The Enjoy Centre, which includes a market, spa, and boutique shops. 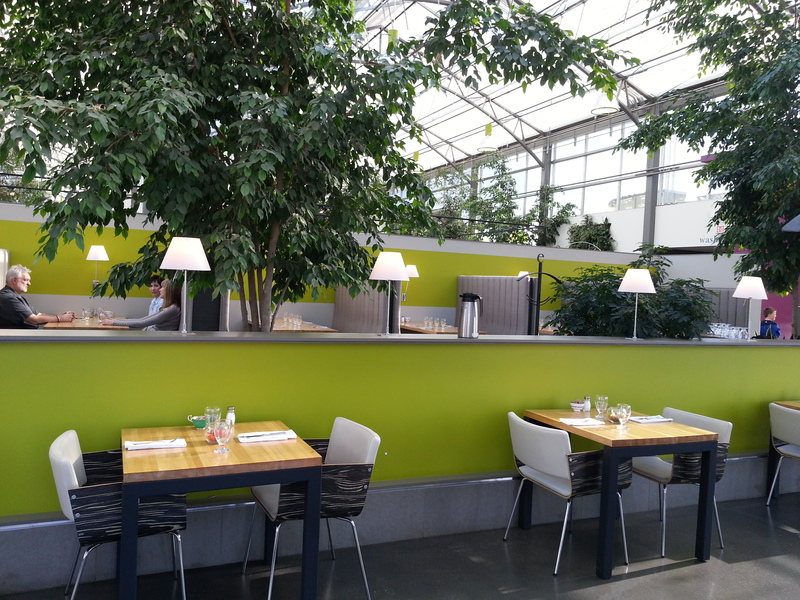 The restaurant is decorated beautifully, with a style that is young, modern, and fun. 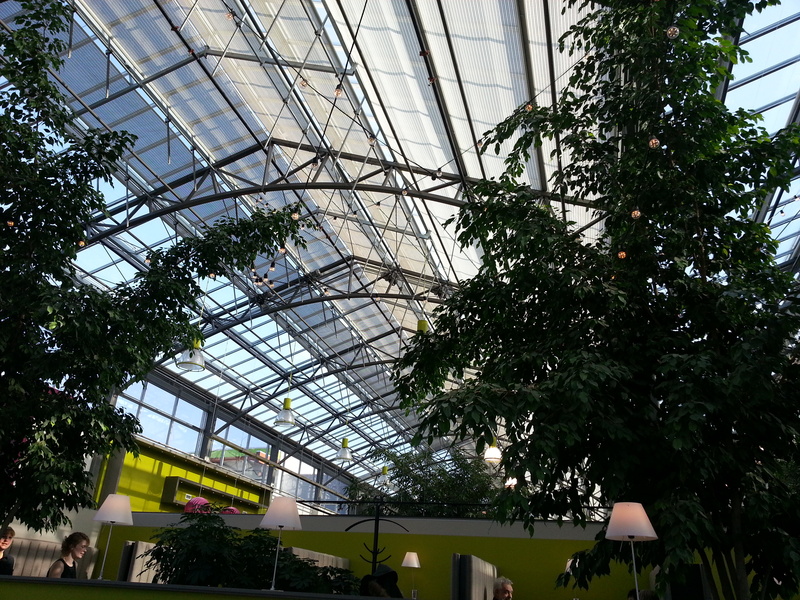 The entire restaurant is covered with glass and filled with trees and shrubs, which makes you feel like you are dining in a greenhouse. You can see in the pictures of the restaurant below. 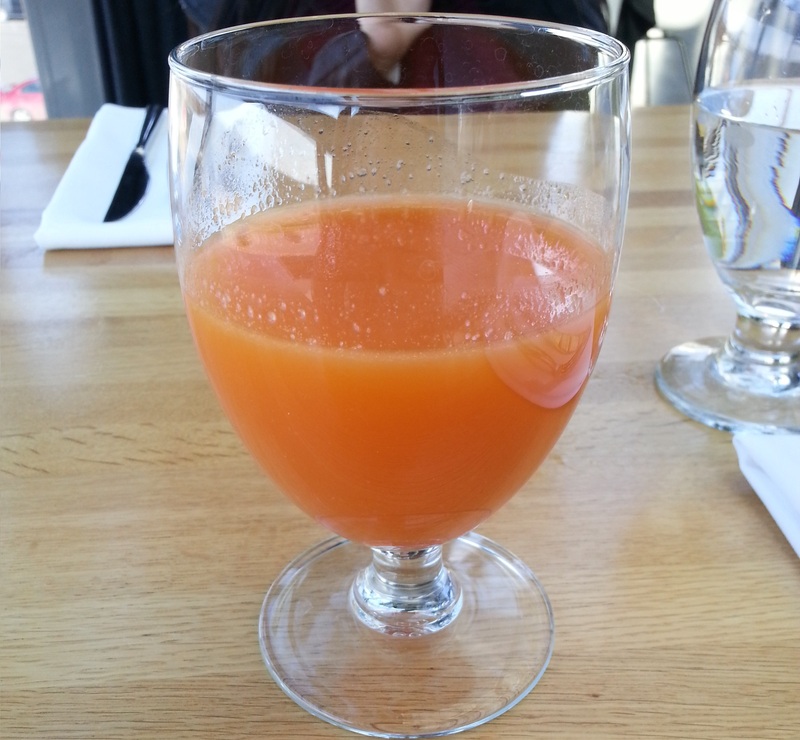 I ordered the fresh pressed juice with orange, apple and ginger. The juice was fresh and the combination of apple and orange went well together. I was worried about the amount of ginger in the juice but the taste of the ginger was not overwhelming and it pleasantly added a bit of kick to the juice. The only issue was that for $5, you get very little juice with a large glass, which makes the quantity of juice seem even smaller. Karen ordered the yogurt. It was delicious. The yogurt and the berry compote were as fresh as it gets. Mixed with the house granola and raisins, it was the perfect yogurt combination. Definitely worth the $4. 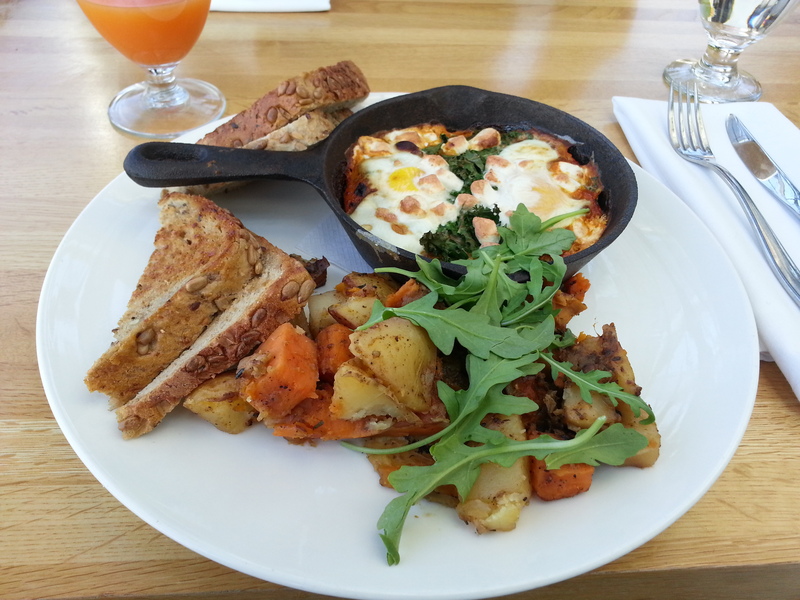 For my main, I had the baked eggs. I was a little disappointed with this dish. The eggs themselves were good. However the sauce underneath the eggs, which was a heavily spiced cumin tomato sauce was not. It was too heavy on the cumin and too salty, which ended up masking the taste of the eggs and feta cheese. All I could taste was the spicy sauce, which wasn’t good in the first place. 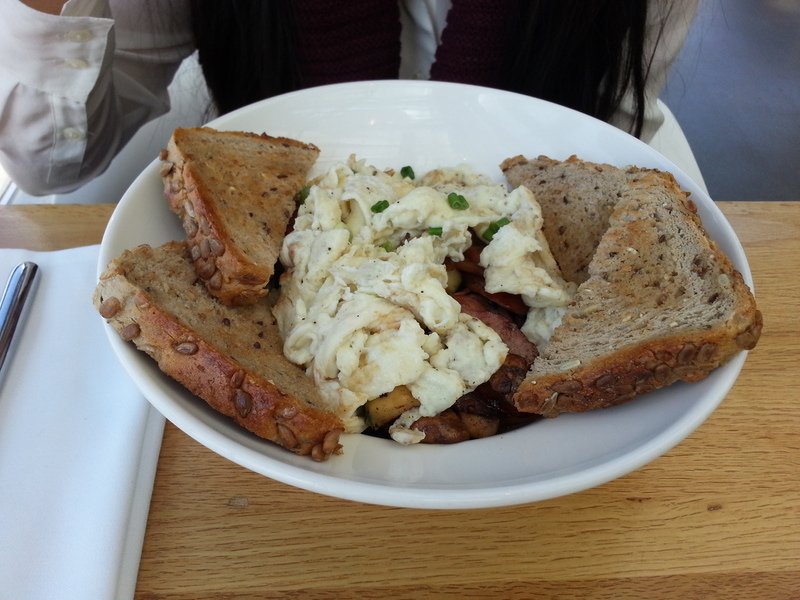 The house hash wasn’t bad but nothing spectacular to boast about. It was a bit bland and the potatoes were too soft for my liking. The bread, which was likely made in house, was great though. Overall, a poor dish, but definitely deserves credit for having such fresh ingredients. Karen ordered the farmers scramble which included turkey sausage, scrambled eggs, winter vegetables, and hash (sweet potato and yellow potatoes similar in my dish). This dish was ok. The sausage was definitely the star of this dish, but the hash was similar to mine in that it was a bit bland and too soft. The eggs were also a bit overdone and dry. It was a pretty average dish and not worth $16. Glass house bistro is a beautifully decorated hyper-local restaurant that cultivates and utilizes its own organic foods to create wholesome dishes. There is no doubt that the ingredients that go into the food are as fresh as it gets. However, their creativity with their ingredients in making not only a dish that is fresh, but innovative is lacking. There is nothing amazingly special about their dishes and that is certainly one area that they can improve on. 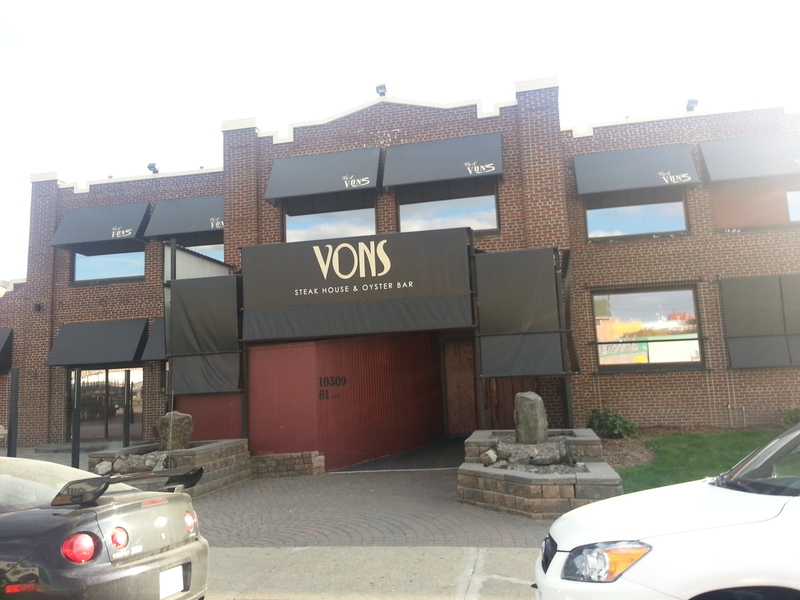 Von’s Steak House and Oyster Bar offers a buck-a-shuck during certain times of the day. We decided to give it a try since you can’t really get oysters that cheap anywhere else in Edmonton. We went on a Sunday early evening. It was right at the beginning of the buck-a-shuck so it wasn’t very busy. We probably didn’t need to make a reservation at 4:30 but if you went a bit later, it would start to fill up. The waitress showed us our seats and explained the buck a shuck to us. $1 an oyster was obviously too good to be true. The catch was that each person had to order a drink (an alcoholic beverage, a soft drink, or a tea). Also, each type of oyster has to be ordered in the half dozen or the full dozen so you can’t just order 2 of each. 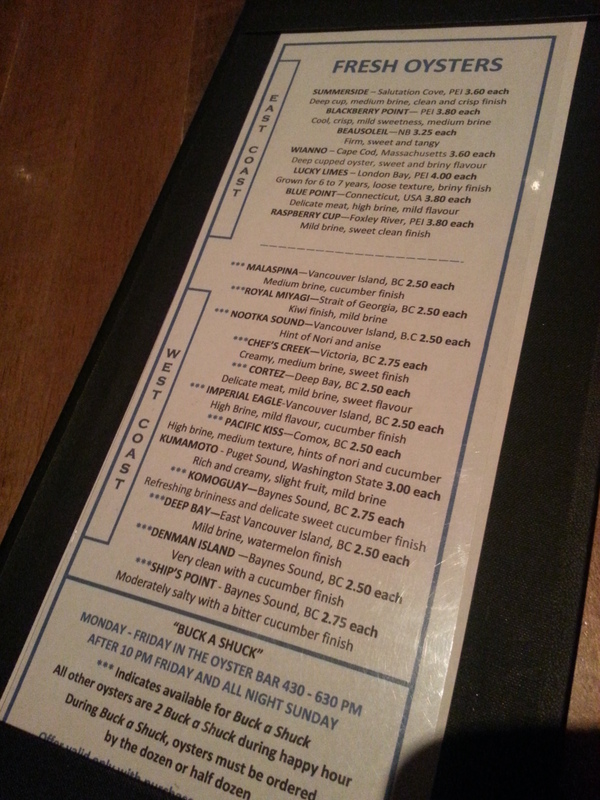 In addition, mostly the west coast oysters were $1, the rest were $2. Finally, there is an extra cost of a few dollars for special sauces (which includes a mignonette, a dill vinaigrette, and another sauce which I can’t remember). We get our beverages but pass on the sauce since cocktail sauce, lemon, and horseradish was included and good enough for us. We were very happy to see the Royal Miyagi since we had them in San Francisco and enjoyed them very much. We decided to stick with the West Coast oysters since they would be the freshest anyways. We ordered the Royal Miyagi, Komoguay, Chef’s Creek, Deep Bay. All of the oysters were very fresh. The first, Royal Miyagi, were very good. They are a medium sized oyster with a mild brine taste and a slightly sweet finish. They are very rich tasting and one of our favourites. The Komoguay were very good as well. They had a lighter brininess than the Royal Miyagi but had a very strong cucumber taste that lingers on. Although they were are on the smaller side, it was a very refreshing oyster. The third was the Chef’s Creek. This was my personal favourite. They are very large oysters with a very creamy texture. Not a hint of fishiness and a very sweet finish. These were very fresh oysters that I would definitely order again. The final and our least favourite were the Deep Bay. These are a small-medium sized oyster which are pretty bland with a hint of watermelon finish. We weren’t a big fan of the watermelon taste. The lemons that were provided were a bit dry and was tough to get the juice out of them. The horseradish was very poor. It was dry and lost its pungency. Either the horseradish had gone bad or they froze the horseradish for too long resulting in dryness and tastelessness. The Buck-a-shuck is available Monday to Friday in the Oyster Bar and on our patio from 4:30 pm – 6:30 pm and all night Sundays. The oysters were very fresh and were shucked in a reasonable time frame. However, the catches to the buck-a-shuck make the bill a bit more expensive than you originally thought. It is a bit of a scam, but still ends up being a decent deal overall. They definitely need to step it up and provide fresh lemons and horseradish. Those condiments are very important compliments to the oysters and needs to be fresh or else it diminishes the quality of the oysters overall. Otherwise, with a group of friends, this can be a very good oyster experience where everyone can try a large variety of oysters at a very reasonable price. 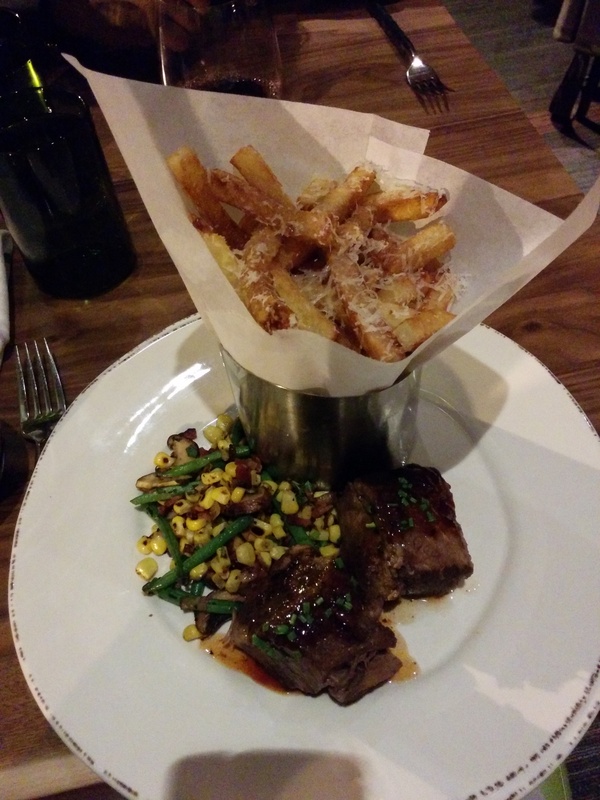 We were most excited to try Wildflower Grill because we had heard some amazing things about this restaurant. Our first impressions were good ones. The decor was inviting and warm. However, for a grill, it was a bit more formal than expected, but we were quite ok with that. 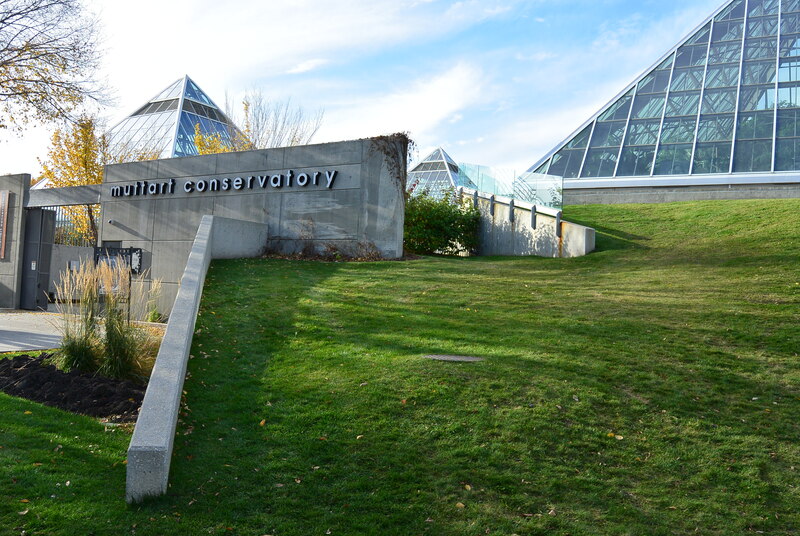 With a higher price point and more of a formal environment, we were treated with service that passed our expectations. 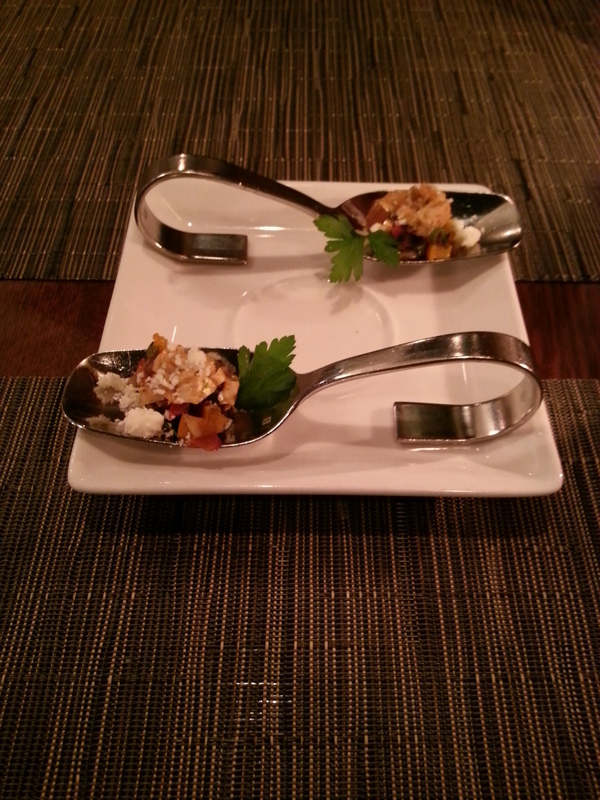 After ordering, we were given Amuse-Bouche to start, which consisted of grilled salmon, feta cheese, and roasted peppers. All I could really taste was the feta cheese and a heavy dose of cumin spice. We did not really enjoy it. 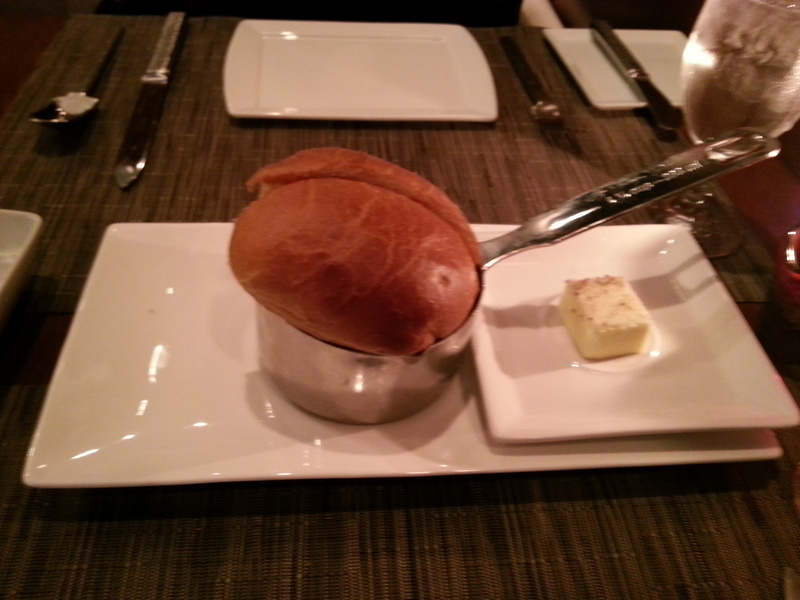 But, then came the fresh baked Brioche with a side of sea-salted butter. They could have done without the measuring cup, but we very quickly let that go because the brioche was amazing. It was fresh, hot, moist, fluffy, buttery, and just melt in your mouth – basically all of that good stuff that just makes brioche amazing. Hands down the best brioche we’ve ever had. We ordered 3 appetizers and 1 main to share, mostly because we were more interested in trying different dishes, but also because the mains did not really appeal to us as much as the appetizers. Our first appetizer was their famous braised beef short ribs. 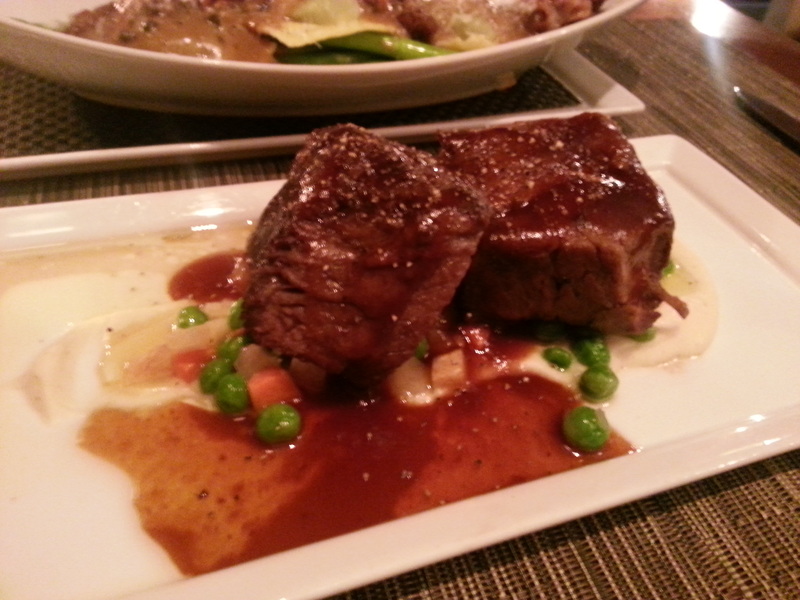 The two very large pieces of braised short rib were melt in your mouth good. They had a very strong beef flavour. You can tell they use very good quality Alberta beef. The reduction and celeriac puree together with the beef gives the beef a sweetness that brings out even more of that beefy goodness. A very delicious appetizer. Our next dish was the Cioppino. After visiting San Francisco and having the Cioppino at Taddich Grill, I was craving for another one just as good. Surprisingly this one delivered, but in a different way. As opposed to Taddich Grill, which stuffed their Cioppino with loads of seafood, this one used a very conservative amount of seafood – only a few small pieces of salmon, 2 shrimp, and a few mussels. The flavour of the broth however, was absolutely amazing. The broth was a very rich tomato based broth that tasted like it took hours to prepare. 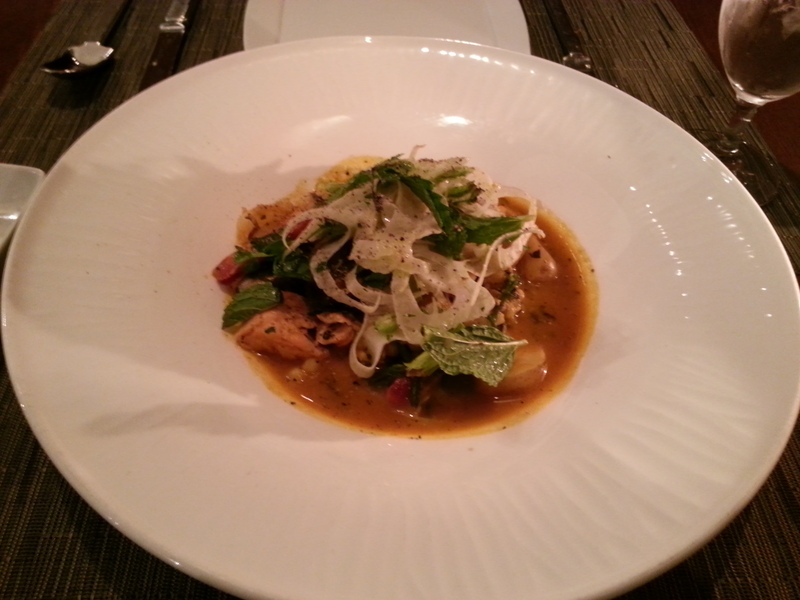 Flavours like fennel, tomato, fish and italian spices realy made the broth very tasty. The seafood was very fresh, but again, lacked in quantity. 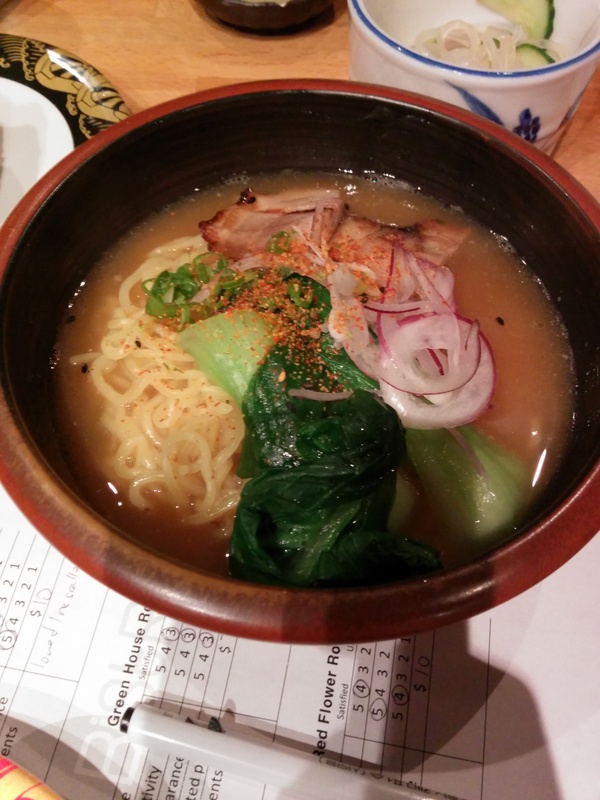 But really, the star of this dish was that wholesome broth. Last to arrive was the mushroom ravioli. 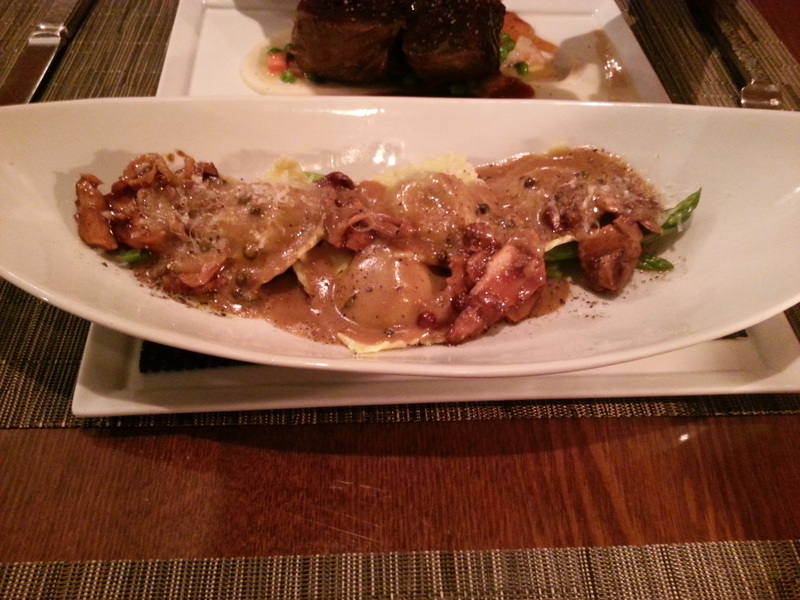 The dish comprised of ravioli stuffed with a puree of three mushrooms, on a bed of asparagus, topped with a creamy peppercorn truffle oil sauce and shredded cheddar cheese. On our first bite, the fragrant and rich truffle oil kicks in with the flavourful peppercorn sauce. The ravioli are loaded with mushroom but unfortunately, the mushroom flavour just wasn’t as prominent as we had expected. The sauce itself is very good, but that is all that you really taste. For a mushroom ravioli, we expected more of a mushroom taste. The dish was good, but could definitely be improved. Now onto our main course: The Bison Tenderloin. The bison was very tender and moist. The outside crust was not that noticeable so you don’t get that crunch with the softness that you get with a really well grilled steak. However, the bison was very tasty. The blackberry sage reduction and the butternut squash puree complemented the bison very nicely as the reduction was fruity and the puree was salty, making the dish sweet and savory. It was another very well prepared dish by Wildflower Grill. Wildflower Grill is more than just a grill. They are a very refined and unique restaurant in Edmonton that puts out creative, top-quality, delicious dishes that really impressed us. Everything was intricate and detailed in their preparation and presentation. Their quality really justifies their high prices. It was a real treat dining here tonight.